A recent show I wish I had been able to visit, unfortunately I never managed to get there, was Reflections, Natalie Dower, at Eagle Gallery. There’s a good review of it at Saturation Point in which James Campion discusses the selection of works, reflecting on some individual pieces, specifically the Spiral Track works (1984), Colour Spiral Track no.2 (19) and Jungle Sphere, (1988), and briefly considers Dower’s relationship to the tradition of Constructivist and Systems art. The exhibition, drawing from Dower’s career of over 40 years, and presenting recent paintings hung in counterpoint to selected historic works, including a selection of intricate reliefs that have not been exhibited since exhibitions at the Curwen Gallery, would have been an invitation to reflect on the connections between works from the eighties up to the present day. Even without a visit, in surveying material available online (the Saturation Point review, an Eagle Gallery website summary, the catalogue with images of the work and an essay by Laurence Noga), I am immediately impressed by Dower’s constancy of purpose along with the way that the relatively simple numerical systems she employs have the power to generate their own forms, almost even without the input of an artist. However, there is an artist here, constantly making choices, experimenting, offering feedback, thus contributing to that larger system, of which each work is a part, a meta-system if you will. Not actually visiting, I can imagine seeing the work, and I can also remember other works by Dower that I have seen before, like the one I saw here once at the Eagle Gallery, and where, in a conversation with the gallery owner Emma Hill, she noted the beautiful, subtly “faulted” quality of the painted surface. It wasn’t the charming oil on wood Hybrid from this show, but it so easily could have been. I now know enough about Dower’s paintings to guess that they share similar qualities. To really experience them however, does mean getting up close and seeing them first-hand. In the excellent publication Natalie Dower Line of Enquiry Alan Fowler summarizes the distinctive features of Dower’s work, in comparison with other systems artists, as displaying “a greater lyricism, a more varied use of colour” as well as “a freedom from the strictly orthogonal imagery that characterized the work of many earlier constructivist artists”. I think the “faulted-ness”, specifically in the paintings, is part of what might be included in the idea of the lyricism of Dower’s style. Some think of the slippage between concept and execution, especially when very slight, as in Dower’s paintings, as a particularly human trait (see comments by Richard Guest on a previous blog post, though referring to quite different content). I think they are right. However, isn’t pure abstract thought also entirely human? (Cogito ergo sum). For too much of my life I considered “mental arithmetic” as an enemy, a bully to be avoided, because I knew I couldn’t subdue it in open conflict. I put it down to the method of rote learning that disagreed with me as a child, and to the threat of punishment for getting my multiplication tables wrong. That beauty could reside here was unthinkable. That was until I started to notice the pleasurable rhythm of “seven sevens are forty nine” or “six sixes are thirty six” (I may never know why “six fours are twenty four” and in fact most of the other lines of the poem, didn’t have quite the same swing and therefore weren’t as memorable). Then one day one of the clever girls in my class showed me a real table (I mean a matrix not furniture) that she had drawn and coloured-in rather attractively, numbering 1 to 12 along the top and down the side and displaying plain as day the multiplication tables, even making it possible to follow a line say from 4 along the top and 6 along the side and find in the cell where they joined the number 24. It was magic, and it was beautiful: epistemology and aesthetics combined! 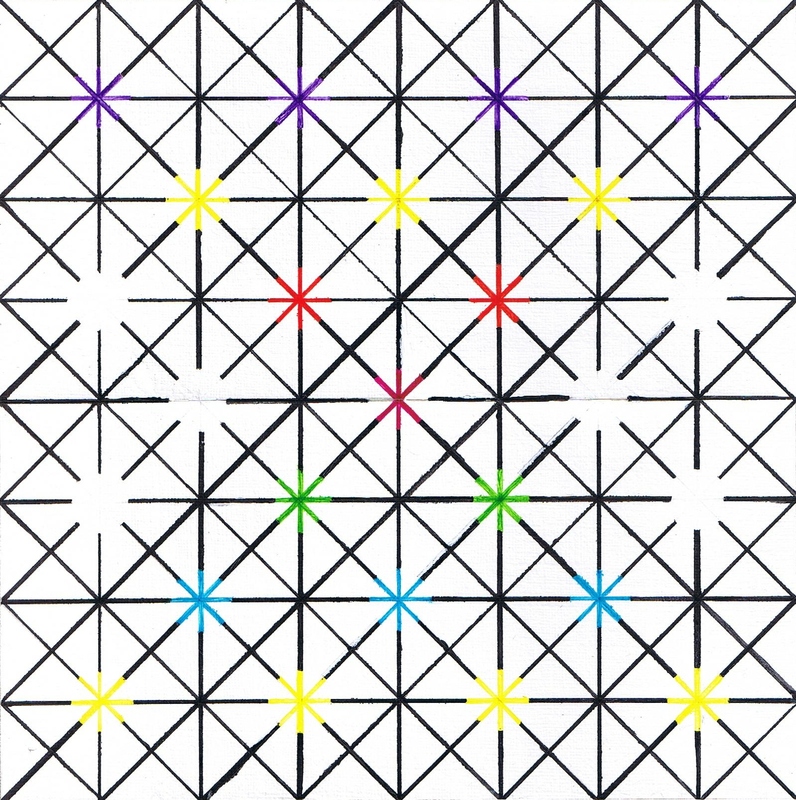 I am in no way comparing this visual table with the look of Dower’s paintings, nor suggesting that her work is a demonstration of numerical or arithmetic processes, simply that the sudden discovery of the beauty of number, via the visible chart has some resonance with my experience of beauty in Dower’s art. Is there in each painting and construction a physical manifestation of thought: logic apprehended by the senses, not so much “word made flesh” as perhaps number made material? I have written before about the highly pleasurable experience of attempting to recover the numerical system that spawned a particular painting or relief, and only sometimes thinking I may have succeeded. I do think this is an important aspect of viewing work of this kind, though it is by no means the only thing. It’s Dower’s work that has me reflecting on the beauty of say a root 2 rectangle, or even a double square, and that’s when I am viewing a specific piece, and also when I am thinking about a work that I once viewed. The numerical system, now communicated, becomes available to my thought independently of the artwork, as if there were such a thing as a “realm of pure thought”. Now what had become material becomes immaterial, non physical, abstract thought. Dower has said “I want the image to be able to attract and hold the attention of the viewer” her objects/images long since attracted my attention, and continue to hold it beyond the physical viewing of artworks. Nevertheless I do wish I had actually seen the show! This exhibition will show a selection of work by contemporary artists who all adopt a reductive position in the context of current art practice. ‘Reduction’ as a term is not limited to defining a single artistic movement, but the threads or references contained within the semiotics of their work demonstrate a consistency – in the use of geometric metaphor, iconographic presence, systems-related elements, and other characteristics associated with the methodology of constructivism and its stylistic/intellectual descendants. The exhibition seeks to demonstrate that this genre has a strong, ongoing presence and that its traditions continue to be developed and explored. 16 – 18 October 2015, 11 – 6pm. Bargehouse, OXO Tower Wharf, South Bank. 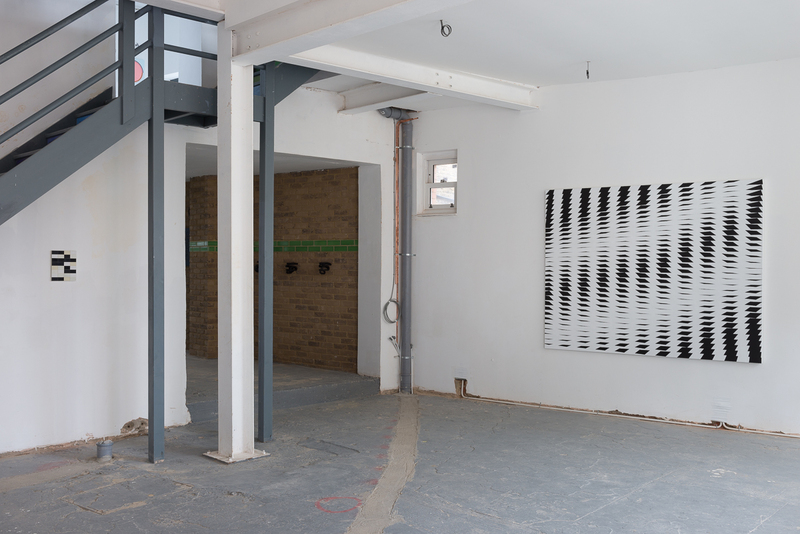 Other new things at the Saturation Point website include a review by Alan Fowler of Lothar Götz at Domobaal Gallery, a review of Adventures of the Black Square by Laurence Noga as well as his review of the recent Generator exhibition, also essays Beyond the Algorithm Towards the Infinite by Laura Davidson and In search of meaning by Nathan Cohen. 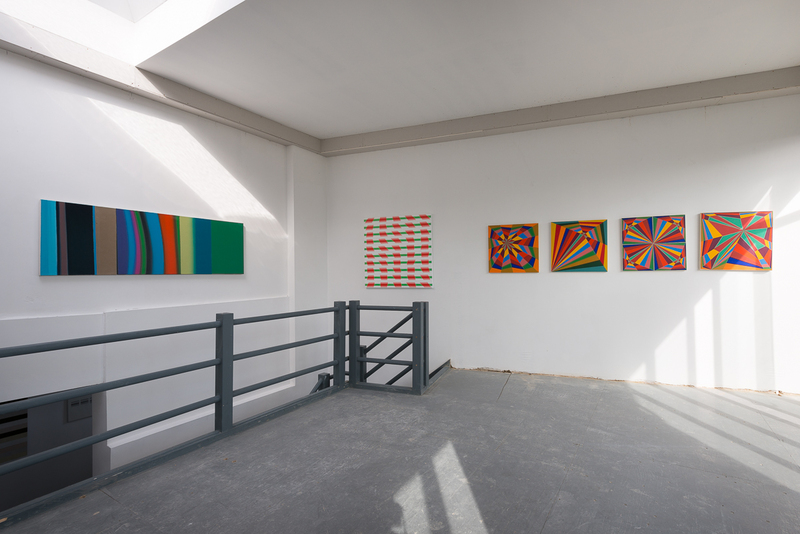 William Angus-Hughes, Rana Begum, Martin Church, Nathan Cohen, Rhys Coren, Natalie Dower, Judith Duquemin, Julia Farrer, Ben Gooding, Lothar Götz, Hanz Hancock, Tess Jaray, Silvia Lerin, Peter Lowe, Patrick Morrissey, Laurence Noga, Charley Peters, Richard Plank, Giulia Ricci, Carol Robertson, Robin Seir, Steve Sproates and Trevor Sutton. 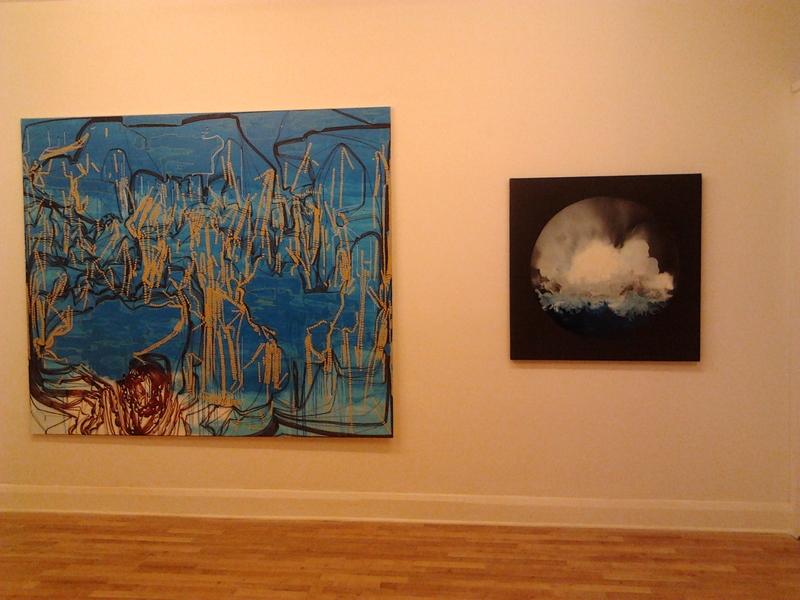 Installation shot, from left to right works by Laurence Noga, Patrick Morrissey and Martin Church. Image by courtesy of Slate Projects. It’s an impressive line up, spanning several generations of artists, born in every decade from the 1930s to the 1980s, and making a convincing case for the growing relevance of abstract art in the UK. Thinking about abstraction’s continued relevance may require me to at least mention Zombie Formalism, (“Formalism because this art involves a straightforward, reductive, essentialist method of making a painting and Zombie because it brings back to life the discarded aesthetics of Clement Greenberg”), if only to suggest that the term, coined by artist -critic Walter Robinson, quoted in brackets above, seems to refer more to the market than to the art and may appear more pertinent in the USA than in the UK where alternative modernisms have sometimes held more sway than the version associated with Greenberg and Fried. It is Constructivism I have in mind, its UK variant Constructionism and the Systems Group, which for the artists at From Centre are more central than Abstract Expressionism etc. The reductive (but not necessarily essentialist or straightforward) works on view at From Centre seem to me to be a genuine attempt at continued participation in a living, though contested, tradition. 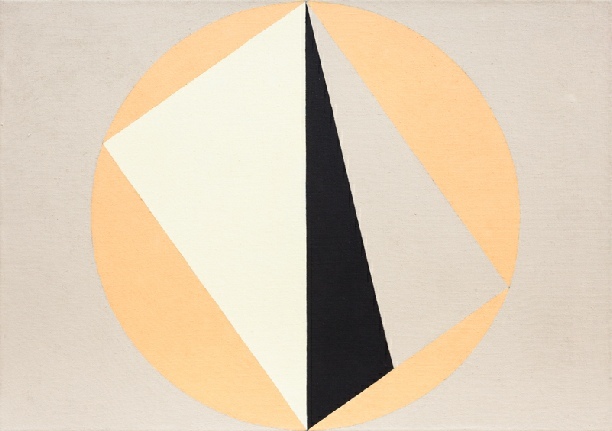 In Dower’s 2013 Painting Polymorph, a subtle pink rectangle is halved down the middle, from which the central point of a pale yellow circle is found, and within that circle a white rectangle beneath an irregular black triangle are positioned. Or maybe there is no “above” or “beneath”, a rectangle within a circle is divided into three different shaped triangles, two white and one black. Alternatively, we simply have a rectangle divided into nine other shapes. The figures and their relationships are not random but calculated mathematically, the parts being strictly determined by the whole, to my mind the most elegant definition of a system. The painting has subtlety, serenity, beauty and a little excitement too, with its alternating views and the slight after-imaging taking place. Natalie Dower, Polymorph, 2013, oil on canvas, 61 x 86.5 cm. Image by courtesy of the artist. Other artists here who employ mathematical or numerical systems include Peter Lowe, a former member of the 1970s Systems Group founded by Malcolm Hughes and Jeffrey Steele. 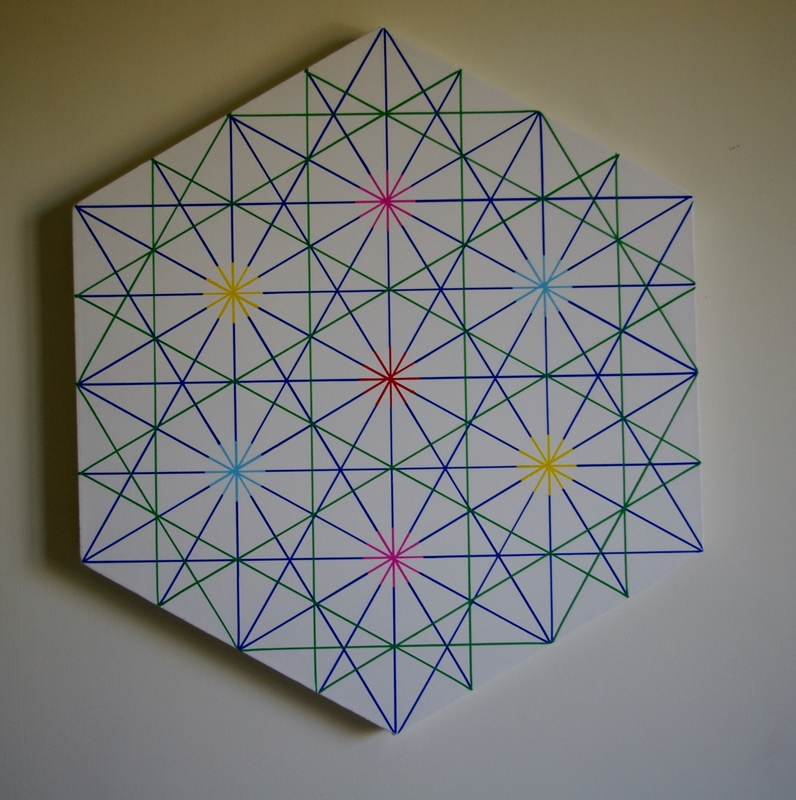 He defines systems in his work as “a way of communicating an intelligible idea in terms of shapes colours and forms, or an organisation principle that I predetermine and allow to run to see what the outcomes will be…” In his painting here, Triangles within a Dodecagon, he takes the regular twelve sided shape as its starting place and bases an equilateral triangle between two of the vertices, or along one of the sides. A second triangle is found by taking the base across three vertices, a third across four and a fourth across five. The fourth triangle being the last one that can be produced by following this process, is exactly central, each of its sides spanning four sides of the dodecagon. In the painting here the resultant figures are positioned on a square canvas, losing the surrounding dodecagon altogether. The colours, black, white and red create four planes: a white ‘background’, in front of which is a plane including the largest and smallest triangles in black, in front of which is the red triangle, in front of which is the white triangle. Of course they shift creating varying perceptual gestalts. 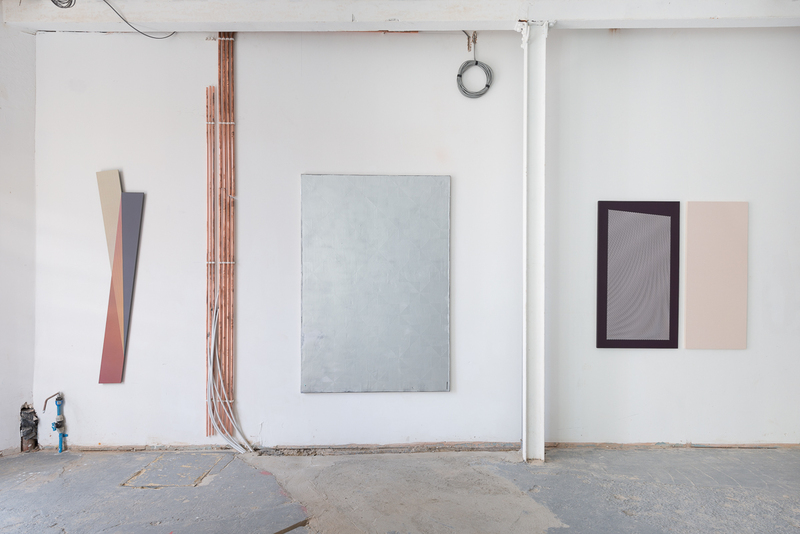 There are shifting gestalts in Rana Begum’s painted relief, No. 317, the actual three-dimensionality of the piece, combined with the movement of the viewer results in multiple variations of form, whereas in Charley Peters’ fascinating painting Plexus we are presented with the illusion of flatness within an illusory three dimensional space. 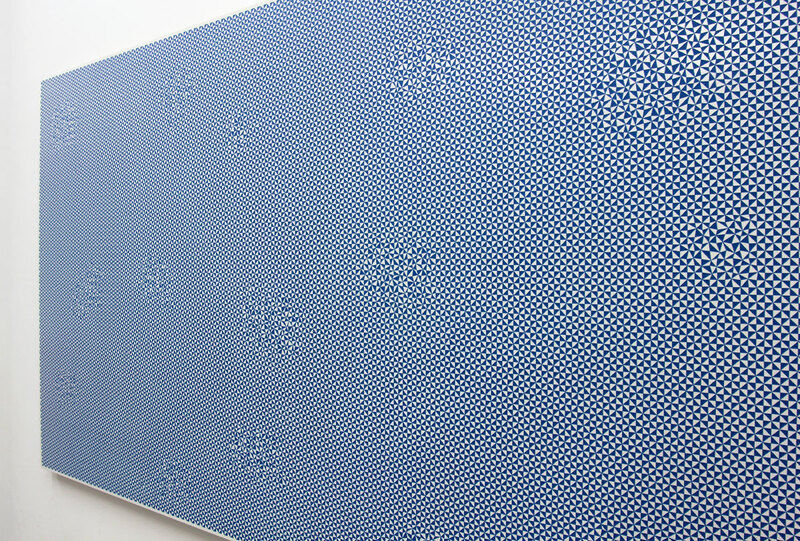 In Giulia Ricci’s Order Disruption Painting there’s something strange going on spatially, the patterned repetition of a triangular motif creating something akin to a systemic field which breaks down in places as the pattern is interrupted, resulting in the appearance of wormholes or spatial anomalies that can also be interpreted as twisting forms caught in the net of the surface whilst at the same time forming that surface. For me, her work explicitly links system to visual pattern. All the artists in this show, perhaps to varying degrees, share an interest in system and/or series. The two tend to go together when a numerical system is being explored. However Julia Farrer’s Knot in Time, seems more to be the product of an entirely empirical enquiry. In both approaches I think there is a search going on, not for the one definitive statement but rather for knowledge. The traditional notion of the masterpiece is challenged, just as it seems totally out of step with our post-digital experience. With Farrer perhaps we have series but not necessarily system, with Laurence Noga I think we have both, but the system is more operational than mathematical. Yet, each work in this exhibition does command attention as its own thing, perhaps the title of Carol Robertson’s painting Aura is suggestive of this. Whilst in the work different coloured bands surrounding a circle might be likened to an aura, I wonder if that famous Walter Benjamin opposition between mechanical reproduction and the aura of the single artwork is also being referenced. Paradoxically, the serial methodology both challenges and upholds the singularity of each individual piece: singular within series, one but not all. There may exist differences in emphasis between the generations represented in this exhibition. Perhaps the older artists show more interest in structure in comparison to the younger ones who may appear as interested in the breakdown of order as in its establishment. Contrasting, say, the Trevor Sutton painting Christow with Giulia Ricci’s Order Disruption Painting, could reinforce this view, as might opposing the serene geometry of the Natalie Dower to the visual excitation of Patrick Morrissey’s work, or the stability of Sutton with the kinetic, off- balance effect of Morrissey (see image below), and I know I am going too far in contrasting the contained circularity of Farrer’s Knot in Time or Robertson’s Aura with the eccentricity of Martin Church’s Definitions (Study No. 3), because mostly what I am finding here is continuity. 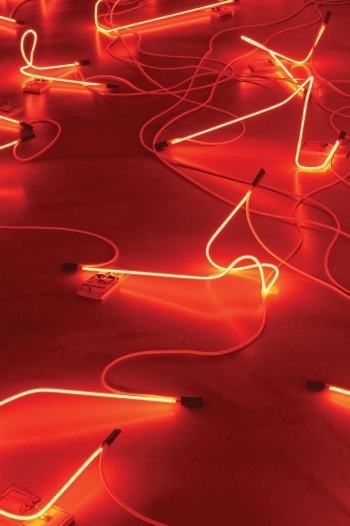 Without succumbing to the much too linear (non-systemic) notion of progress, I do want to suggest that these generationally diverse artists, in their shared commitment to an economy of means and a formal language, rooted in the tradition of constructivism and systems art, continue to develop this rich field of artistic activity. Saturation Point is the online editorial and curatorial project for reductive, geometric and systems artists working in the UK. 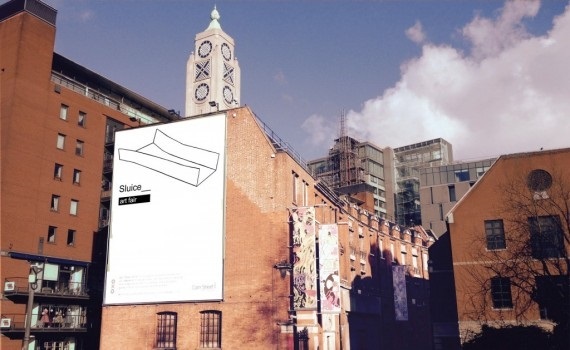 It grew out of the exhibition of the same title held in 2011, curated by Patrick Morrissey and Hanz Hancock. The site includes exhibition information, reviews, interviews and publications. 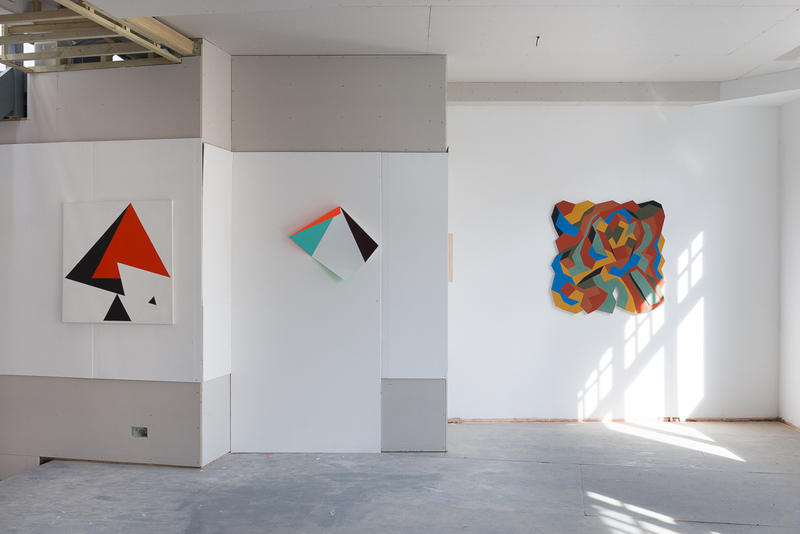 Among other things, you can see a recent review of Vanessa Jackson: Rough Cut and Faceted, by Charley Peters and Fine Line: Concrete, Constructivist and Minimalist Art, by Laurence Noga, as well as new interviews with Natalie Dower, Jane Bustin and a very recent one with me. You can also follow a link to purchase the book Natalie Dower: Line of Enquiry, and you can download the Saturation Point 2011 Catalogue. In my admittedly biased view, it’s a really interesting project. Don’t take my word for it, go check it out for yourself. First Come First Served, the open show at Lion and Lamb Gallery, with no selection criteria other than ‘first come first served’ is described to me by one of the participants at the hang/opening as “democratic”. If that suggest selection by majority then perhaps “anarchic” says it better, so long as we remember that anarchy and chaos are not at all the same thing. I keep hearing people say how curated it looks, how considerately artists have placed their work, leaving room for others and seeking complementarity rather than competition, which is perhaps what you would expect at a venue named after that biblical lion and lamb pairing. It’s a collaboration of sorts, unspoken and implicit, reminiscent of a group exercise I learned from Simon Horton, author of Negotiation Mastery, where in large group of people each individual chooses two others in the room, and without letting on who they are positions themselves so they form three points an equilateral triangle. After a few minutes of moving around, and without speaking or signalling to each other, the group quickly settles into a whole where every part forms an equilateral triangle with two others. The space at Lion and Lamb seems to have been negotiated in a similar fashion. The only thing that is predictable about a show of this kind is its unpredictability and variety. 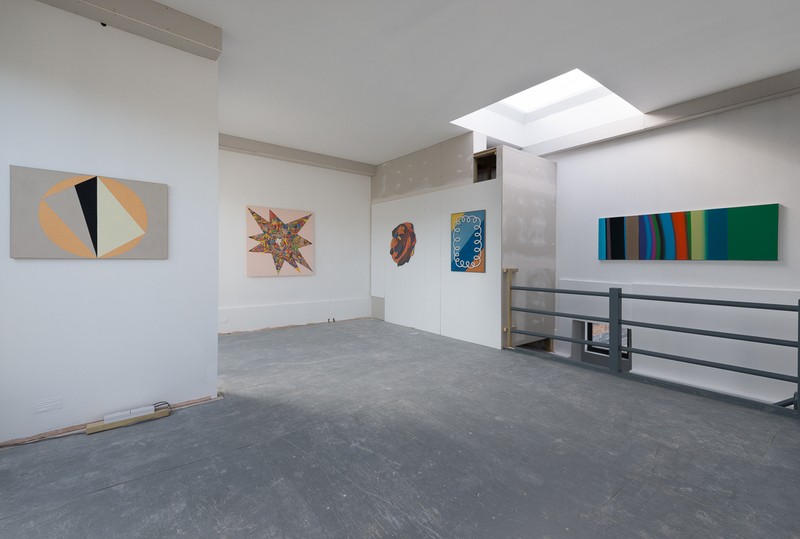 There are works here by a diverse range of artists including Katrina Blannin, Alli Sharma, Sarah McNulty, Andy Wicks, Laurence Noga, Andrew Bick, Gwennan Thomas and a host of other names some well known and some new to me. I have met Nancy Cogswell here at a PV at the Lion and Lamb Gallery before so it was good to meet her again and to see her exquisitely painted masquerade-style mask in a drawer (sorry, Nancy I don’t know the title and my snap isn’t good enough to show). I met Laurence Noga also at the show he curated here a few months ago. Today his diptych is reminiscent of one of the paintings he showed then, but much smaller, almost like a miniature preliminary study, except that the collage elements, I think, make it look much more a thing in itself. It’s quite beautiful, tiny and jewel-like. Removing my own 8″ square painting Duke Street Tetractys from my bag, I place it in a position that had been left especially for it, directly beneath a lovely painting that could be a photogram of a necklace. I am enjoying talking with artists about their work and I am asked a few times about my own, one person tentatively classifying it as “Op?” It occurs to me that, like “systems”, that’s a category that often gets disavowed: “it’s not quite Op” or ” it’s not strictly systems art” as though either of those would be very bad. So I proudly answer “yes, and it’s systems based”. I get to say something about my interest in colour-spread phenomena. Andy Wicks‘ unique lino and digital print with acrylic, Mudlarks seems uncharacteristic of other work I have seen by him, more figurative perhaps in that there are figures in a ‘land’scape, though there is a marine connection as there are with other of his paintings. The lino cut here, taken from a Victorian etching, shows boys ‘mudlarking’ on the banks of the River Thames, superimposed on a WW2 propaganda image of the Royal air force flying over a naval convoy, boys and their toys, so there is this interesting layering of references and time periods, brought up to date by the adding of Wellington boots to the figures. Seeing is a complex process, triggering imagination, memories and associations. This complex little print highlights for me what might be ‘seen’ in our mind’s eye when we view an image, reminding me of how, at a more general level, we construct meaning through the processes of framing, layering and juxtaposition. Complex also, but in a different way is Katrina Blannin’s beautiful, systems based, gouache on paper. I am interested in the multiple ways of reading it, negative spaces shifting to positive shapes, and back again, only now it’s a different negative space I am seeing. However hard-edged, or high in clarity the image might be, ambiguities abound. Do we say that something is “deceptively simple” when at first sight it communicates simplicity and matter-of-factness whilst on continued viewing it turns out to be thoroughly nuanced? Then I start to wonder about how the colours were achieved: to what degree were they mixed prior to being placed, or how much is the result of physical layering on the paper? Then again, how much of the mixing is taking place on my retina? 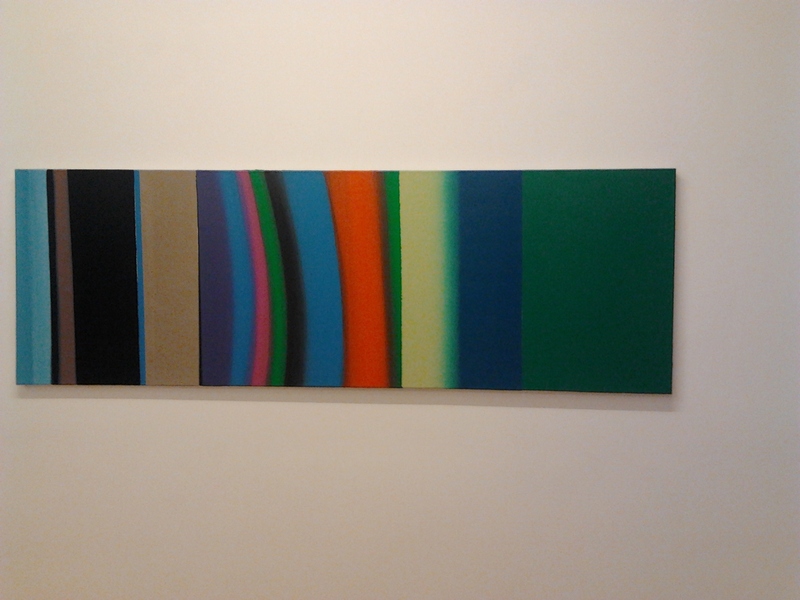 And I note that a painting can be a lot about colour without necessarily being highly coloured. First Come First Served is on at The Lion and Lamb Gallery until 11 January 2013, all the works are for sale. The paintings by Anthony Daley, Caroline List, Laurence Noga, Katie Pratt and Raf Zawistowski on show at Intuition/Anti-intuition at the Lion and Lamb Gallery until 29 September 2012 have something of game and play about them. The word ‘play’ suggests an activity that is free, spontaneous, intuitive whereas ‘game’ connotes something with pre-established rules, and an activity that might resemble work more than play even though a game is quite clearly played, rather than worked. There is something about abstract painting that is playful. That dialogical approach to painting where the artist does not know what s/he is going to paint before beginning has a lot of play in it. Which is not at all the same as saying there are no rules. Even “anything goes” is a rule, and all behaviour is rule governed, we just might not know what the rules are. Then, there is another approach where the rules are much more explicitly stated and many more of the decisions about the work are made before the painting is executed. The former approach is improvised and the latter is pre-planned. The former seems more intuitive and the latter anti-intuitive. On visiting the exhibition and reading that its title “refers to a shared approach through process and materiality” and that “a conscious strategy to subvert intuition is developed by an engagement with rules or games, often through self-imposed instructions” I can imagine that much of the approach these artists take is indeed shared. However, the degree of intuition or anti-intuition, play or game, varies from one artist to another. I don’t think that I am seeing anything here that is as pre-planned as say Natalie Dower or Katrina Blannin (whose work I saw when I visited last time). And even within this shared approach that deliberately follows rules, I struggle to work out what the rules are. And this is part of the pleasure of the show for me: I feel a bit like a spectator of a sports competition, the rules of which I do not know but seek to deduce by watching the game play out. Except that I get nearer to deciphering them when I watch the sport than when I see the paintings. It’s probably just me, but however long I study, I doubt I will fathom the rules. (Whilst I got a sense of this when looking at Natalie Dower’s paintings in that, when I was sure I had worked out what was happening I then discovered that there was much more going on than that, or that I was just wrong, at least I thought that I was getting somewhere, and most of the time I probably was.) Here I am less sure I am getting somewhere. Then, I realise that this too is a game. My experience as a viewer is both intuitive and anti-intuitive, I wonder if I would have been puzzling about the rules if I had not read about that strategy to subvert intuition, maybe I would have intuited them. Anyway, I am enjoying the puzzle as I view the evocative and lyrical paintings of Anthony Daley, Caroline List and Katie Pratt. Each containing allusions to a world outside of the canvas, although what is being celebrated is the painting process. List’s painterly marks, fluid in blues, whites and greys, sometimes a shiny lustre glaze and sometimes a matt white flurry, can’t help but suggest a seascape, possibly being viewed through the porthole of a ship. And I am making tree associations when I view the highly playful lines and gestures in Katie Pratt’s marvelous ‘Jamerera’. 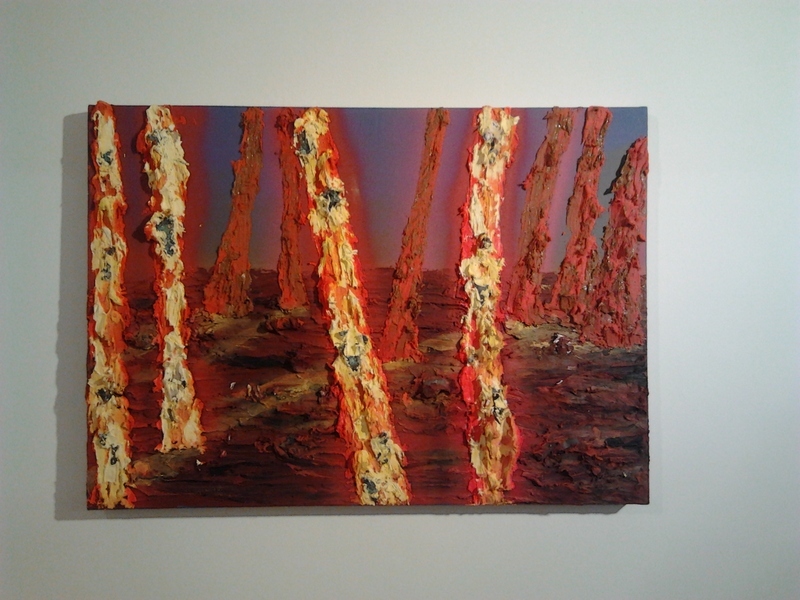 Daley’s “like” paintings invite metaphorical landscape readings, not just in their titles. I am finding landscape imagery in Raf Zawitowski’s ‘West of Eden’ and again I think the title confirms the association, but this time far from a lyrical evocation, I am reminded of the violence and ‘unnaturalness’ of nature. If the others made connections to earth and water now it is fire I am being confronted by. Then, in case I am allowing my intuition to over-indulge in associations the density of the surface (the paint stands about an inch from the canvas) brings me quickly to my senses, the look and texture of the paint as well as the smell, I can definitely smell oil paint, asserts the materiality of the painted object. C.G. Jung opposed “sensing” to “intuition” and I wonder if this distinction is relevant here, at least to the game I am playing of viewing these paintings. 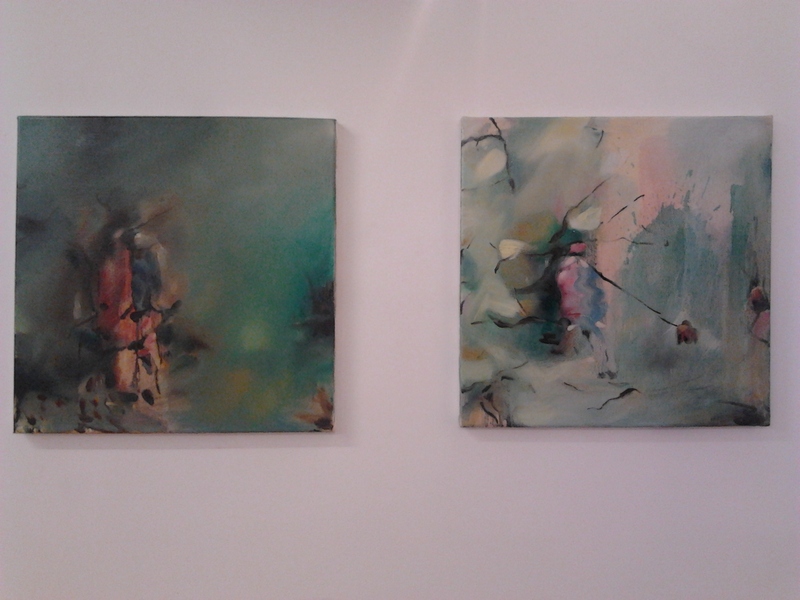 The two paintings by Laurence Noga also bring me back to my senses, specifically the visual. That “colour underpins decisions” is clearest here. Yet the results of those decisions, that suggest control of the process, also lead to a disorienting effect in the viewer, as they must have done in the viewer/artist when the painting was in progress. It is as if the paintings assert the unpredictability of colour, however much you think you know about it. whilst the process may indeed be anti-intuitive, the colour arouses not just visual excitation but also all kinds of intuitions, thoughts, associations, prompted by the experience of viewing but way out of the control of the artist.